Just one day after the away uniforms made their debut to the 1. 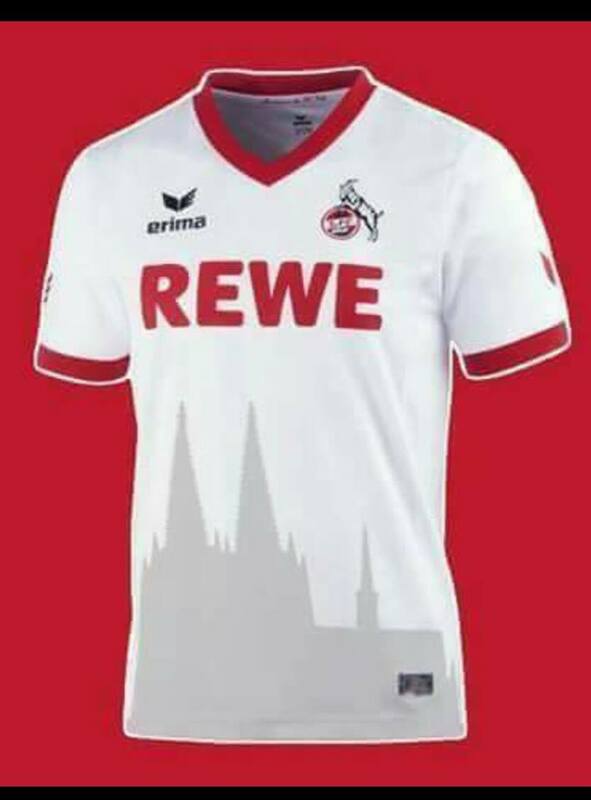 FC Köln-loving public, the home kits have arrived, leveraging the most-recognizable tourist attraction of the club’s home city to remind all that home is, indeed, where the Dom is. If you’ve been to Köln, you have to have seen the Dom. The Cologne Cathedral is virtually impossible to miss for its sheer majesty and prominence, so near the main train station. Even if you’ve not yet made the pilgrimage to the see the EffZeh or even for Karneval, you see the landmark represented in the club logo. The black silhouette of the cathedral spires are part of the background for the club name and find themselves beneath the dominant stance of Hennes. One of three Dom ‘blips’. The added Dom-iconography is even more subtle, if also somewhat unmistakable. Evoking the dark-red diagonal stripes of the away jersey, the home jersey features five diagonally running lines across the front, below the sponsor logo. 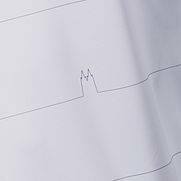 Three of these lines are interrupted by what is reminiscent of blips you see on medical-monitoring equipment, except these are not marking heart rate, rather outline an image that is near and dear to the heart of all Kölners: the Dom spires. 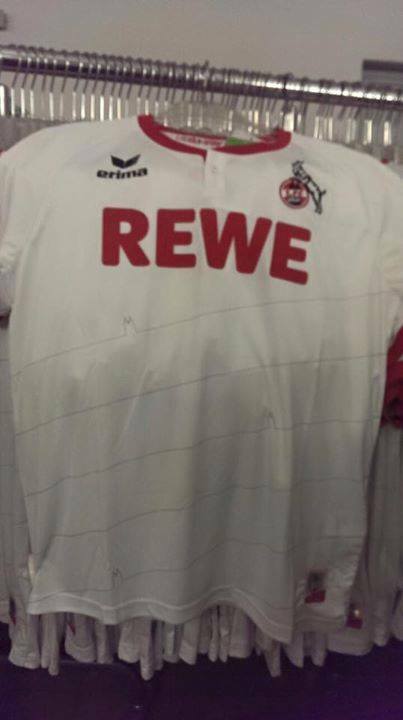 The new home jersey is otherwise a very straightforward white, single-button, henley-style shirt with the “erima,” “REWE,” and club logos all where you’d expect them. The use of red for the collar and sleeve hems make the shirt fairly classic-looking, and would likely win universal approval for the simple, clean look. What folks had hoped for? Originally, it was thought the home jersey would be presented on Monday, but a leaked photograph of the new jerseys perhaps forced the club to move the presentation forward as internet-debate over the design raged, with public reaction being largely negative. Word that the Dom would play a role in this year’s design preceded its Friday confirmation. What we got . . .
Toward the end of the 2014-15 season, an illustration of what appears to be the 2013-14 home jersey with a gray silhouette of the cathedral at the bottom of the shirt (see left). Integrating the Dom into a jersey design is a fairly easy way to evoke the hometown pride of a club that is so closely tied to the identity of its city. Hence, the idea of such a design seemed to win instant approval, even if not all agreed that the way it was done in this particular image, which some assumed to be an early leak of the actual design. You can purchase all the new gear at the FC Köln online fan shop, though those living outside Germany must contact the store directly to arrange for shipping. Whether you intend to wear the new home shirt or not, get down with a bit of “Home is (where the) Dom is” with local rock favorites Kasalla. Be the first to comment on "Home is where the Dom is! 1. FC Köln Unveils 2015-16 Home Jerseys"